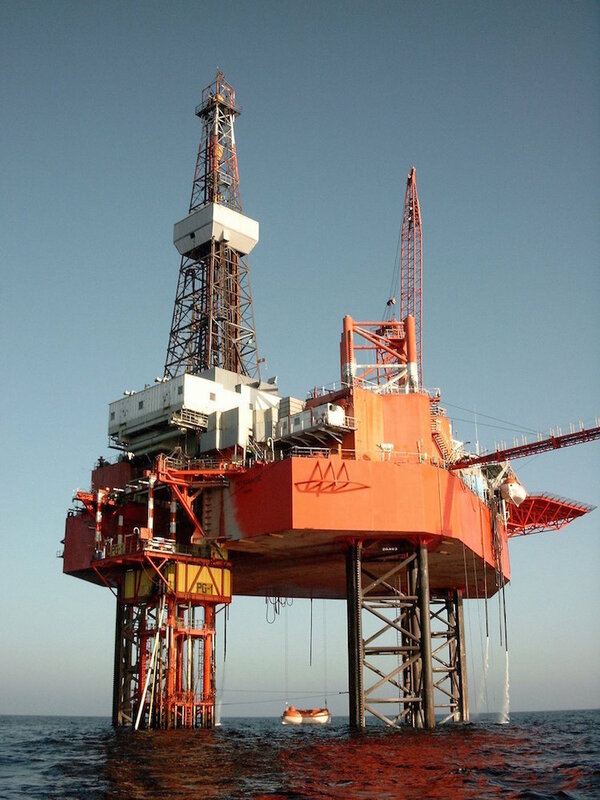 What Causes Corrosion in Oil Rigs? Corrosion is a serious problem for offshore oil companies, potentially leading to extremely unsafe working conditions. At best, corrosion can break machines and platforms, causing businesses to lose time and money as they await repairs or new structures. 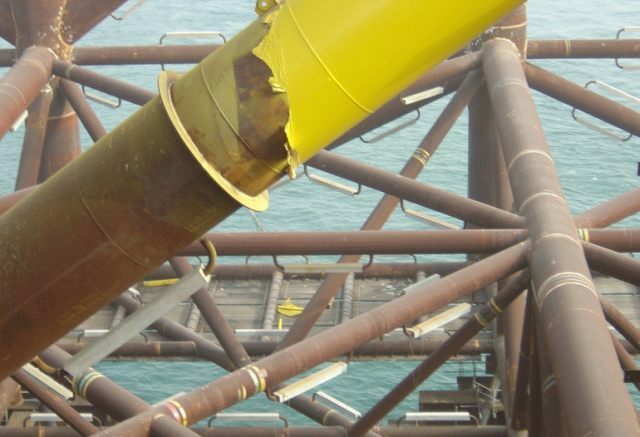 At worst, corrosion can result in equipment failure and accidents on the rig. An offshore oil rig at risk for corrosion damage. Corrosion in an oil rig is an electrochemical process. The seawater acts as an electrolyte, and the different potentials between different parts of the steel structure cause metal ions to move from the surface of the structure and diffuse into the electrolyte solution. 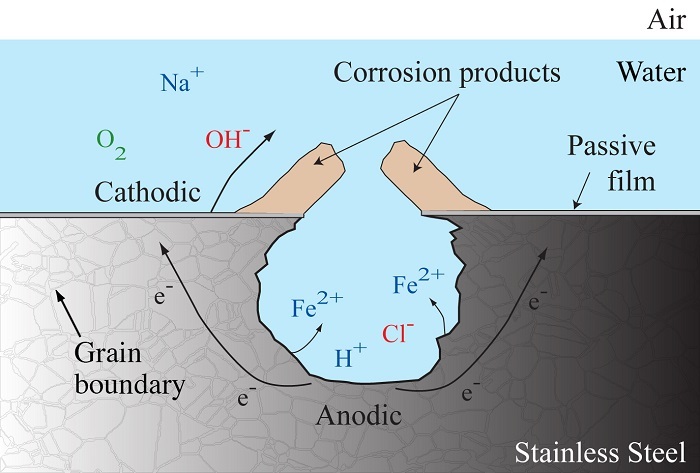 Here, they react with oxide and hydroxide ions to form corrosion products (see the figure below). The presence of dissolved oxygen is also an important concern. Because dissolved oxygen is greater near the water’s surface, it imposes a greater corrosive overpotential in the vicinity of this region as compared to the metal further under the surface. As a result of this process, pits can form at the metal surface of the platform. Corrosion within these pits as well as within crevices, such as the structure’s joints or imperfections in weldings, occurs as an irregular corrosion front on the steel surface of the platform. Over time, the increased stresses caused by the pits, crevices, and other structural anomalies resulting from the electrochemical reactions lead to fractures and breaks within the structure. The rate of corrosion depends on the microstructure of the metal itself, which, for oil rigs, is steel. An outline of the corrosion process for a steel structure in seawater. Image credit: Naval Research Laboratory (NRL). Coating is a simple method of corrosion prevention. In this approach, a barrier is placed between the steel and the seawater, and the surface is insulated. Successful coating involves the right material selection — epoxy mixtures are common coating materials — and proper application of the coating. Although this method is efficient, all organic coating materials are, in fact, semipermeable to water and oxygen. Thus, even if coating is used as a protection method, corrosion can still occur in the structure after some period of time. Aside from coating, we can protect oil rigs against corrosion through cathodic protection. Cathodic protection is available in a few different forms. Impressed current cathodic protection (ICCP) is one type of cathodic protection that involves applying an external current to the steel platform, preventing the surface from becoming anodic. In this way, the entire steel platform acts as a cathode, stopping the electrochemical process in corrosion from occurring and preserving the structure. Sacrificial anodes are another form of cathodic protection designed to shield structures from corrosion. In this case, the steel structure is electrically connected to a less noble metal, such as aluminum, that acts as an anode. The metal is “sacrificed” by slowly corroding as the steel structure acts as a cathode and is protected from corrosion. Sacrificial anodes (the white, handle-shaped objects) protect the oil platform from corrosion. Image by Chetan, via Wikimedia Commons. For an engineer designing a corrosion protection system for an offshore oil rig, there are some comparisons to make between these different cathodic protection methods. Sacrificial anodes, for example, do not require an external power supply, while ICCP does. Also, as sacrificial anodes slowly corrode, they need to be periodically replaced. The anodes used in ICCP, meanwhile, are stable for a much longer time. It is important to note that anodic dissolution may also occur in ICCP unless dimensionally stable anodes (DSA), which generate oxygen or chlorine, are used. Without the use of DSA, the consumption of anodic material may be larger in ICCP. This cathodic protection method is, however, considered a “safer” alternative to sacrificial anodes, as the potential can be controlled by an input of electric energy. The method of cathodic protection that is selected should depend on the needs of the oil rig operation. For instance, sacrificial anodes may be more beneficial for short-term use, as they are economically efficient and can be quickly implemented. ICCP is a steeper investment and best suited for long-term needs and larger structures. Oil platforms can be both expansive and complex. As such, it is helpful to understand the parameters for the structure and the method of protection during the design process. It is also important to closely analyze the corrosion process at the boundary between the seawater and the steel surface. Optimizing the design of oil platforms leads to safe, functional, and well-protected structures.